Interests - Story tapes/audio books, Harry Potter, Jacqueline Wilson, Series Of Unfortunate Events, Twilight series, holidays/short breaks away, eating out, going to concerts, girly things like spa days, manicures etc, X Factor and Eastenders. She also likes music: Kaiser Chiefs, Kylie, Pussycat Dolls etc. Stephanie was diagnosed in may 1999 with Juvenile Battens Disease. She was slowly going blind from the age of 5 but the specialists refused to believe us and said she was “hysterically blind”- i.e. making it up! She and our whole family were put into “therapy” resulting in six farcical months delay before parents insisted in being referred on. The diagnosis was followed quickly on seeing a specialist of rare diseases at Oxford Radcliffe Hospital and it was confirmed she was blind. The disease is a progressive neurological genetic one and she is now wheelchair bound with a mental age of around 10 years. Despite everything Stephanie is a happy and cheerful and enjoys every minute of her life. She is a joy. Her life expectancy is late teens/early 20’s. She particularly loves holidays and short breaks, eating out and playing with her young nephew. She attends a school for the blind and has many friends but rarely received mail which she loves before joining Post Pals as people don’t tend to write to blind people! Our beloved daughter, Stephanie, passed away at Basingstoke Hospital in the early hours of Saturday 2nd February. She suffered Juvenile Batten’s Disease and had developed pneumonia. A blessed release! We are in the process of moving Stephanie to a specialist residential hospice which deals mainly with Batten’s Disease. It’s time. She needs 24 hour nursing now and spends a lot of her day ‘absent’ from the real world. I think it would be best if Stephanie were to move into the ‘Moved On’ section after the end of April as I will have to get a job and it will become more difficult to keep on top of post and replies then. The very good Post Pals Steph has made over the years we will of course continue to correspond with, but I won’t have the time to forge new friendships for her. Thanks to Post Pals for everything. It’s been fun. Stephanie’s PEG operation was postponed again due to the snow. We are now due to go into Basingstoke Hospital on Tuesday 2nd February for a scan, followed by the operation on the 3rd. Fingers crossed it will be third attempt lucky! She isn’t all that settled at the moment and seems worried and anxious most of the time. Lots of sleepless nights for mum! Thanks to all Post Pals for all the lovely things sent during November and December for Stephanie’s birthday and Christmas. We are due to try and put in the PEG again. We are to go into hospital on Wednesday 6th for a scan on her hernia etc and then the PEG may go in on Thursday 7th. Fingers crossed it all goes OK as although we have had a quiet, peaceful Christmas, Stephanie is beginning to gag on taking in food and has bowel problems on almost a daily basis. Love to all and many thanks for all her presents – again. You are all so wonderful and keep our spirits up! Stephanie was unable to have her PEG inserted this month as she has a hernia. Apparently, they can do it but need another team of surgeons, so we shall have to go to hospital again sometime in the near future. She is stable at the moment, we seem to have the medication as good as we can get it (finally) and she has been able to go back to school to see all her friends, which is an absolute blessing. She had a reasonable birthday with all the family around and a Disney Princess birthday cake (of course). Thanks to everyone for cards and presents. Let’s hope for a good run up to Christmas! Stephanie has been in crisis all summer and we are still struggling to get her complex seizure activity under control. We are going to introduce another anti-convulsant as she is having frightening hallucinations and episodes. She managed to go back to school two weeks before half term but has to have another week off in November to sort out a new wheelchair for her different needs and to have a PEG inserted so that mum can get enough nutrition and medication in as she is finding eating difficult. Life isn’t a bundle of laughs at the moment. Mobility is none existent and we have to use a hoist – the house is full of equipment! We are waiting for a permanent residential placement now as Steph needs 24 hour nursing care and mum and dad are taking it in turns to sleep in her room. Mum says she needs a holiday! Stephanie is still poorly. The meds are helping a bit but she is still very anxious and worried all the time. She won’t be going back to school immediately and we are seeking a permanent residential placement as she will soon need 24 hour nursing care. Thanks to everyone for all her presents and cards and good wishes. Sorry we can’t reply to everyone but mum is worn out at the moment. We do appreciate everything though. Stephanie has been really poorly. She spent a week in hospital having tests which proved negative but she is suffering mentally and we are trying various anti-psychotics to try and help. She is not well at all. We haven’t had much post this month but continuing thanks to all those who remember Stephanie, especially our friend in Israel who never fails to send a parcel every month. Stephanie has been quite poorly this month. She has had a few seizures and we have had to increase her anti-convulsant drugs. She is also suffering some paranoia and she worries constantly, mainly about her health and toilet issues. Her carer at home broke her elbow so she is out of action for a few weeks too and everything is a bit difficult at the moment, so let’s hope next month is better! I took Stephanie for her scan today and am very pleased to report that her kidneys and bladder are functioning normally. Thank goodness for that. Stephanie’s carer Debbie has broken her arm so we are without help for a bit. Stephanie had a nice trip to Cadbury World though with the Berkshire Blind Society during half term and brought lots of chocolate home! Yum! So, back to school tomorrow for the summer term and lots more fun! Stephanie has been poorly again with a UTI and has to have a kidney scan to see what’s going on. Antibiotics made her very ill but she’s slowly getting better. Stephanie’s new carer, Debbie, has been taking her out and about this month and she went to her first Disco at a proper nightclub and drank vodka & cranberry! Dirty stop out! She breaks up for Easter holidays on Thursday and will be going to see Sponge Bob Square Pants with Debbie at the theatre. We also have a couple of days booked at Douglas House in Oxford and mum and dad are going too, so that will be fun. We have some new equipment to sort out, like a rise and recline chair, and some other stuff to make life a bit easier as Stephanie’s mobility decreases. All in all she is very well at the moment though – long may it continue! Stephanie’s speech is now very difficult to understand and we have to try and get a keyword to make sense of what she is trying to tell us. Mobility is decreasing and we have had lots of new equipment at home to help make life easier so she can retain her independence. She is looking forward to going to see the X Factor tour on Sunday and next Friday will be back at Wembley for the Kaiser Chiefs concert. It’s a very busy month! Thanks to everyone for her Valentine’s gifts and cards. She was very proud to take them to school to show her friends. Stephanie has had a quiet month. She enjoyed a top to toe pampering day at our local salon though – she had a massage, manicure, pedicure and had her hair done for her Auntie and Uncle’s 25th wedding anniversary party. We are looking forward to christening baby Freya (Stephanie’s niece) on 8th February too. Steph has recovered well from her UTI and seems in good spirits at the moment. We had a family Christmas and went to Brighton for New Year, but Stephanie has a bad UTI at the moment and is very down. We were at hospital yesterday with her but she’s now on antibiotics and seems to be feeling a little better. Here’s to as healthy 2009 as possible. Thanks for all your lovely Christmas presents and cards. We really appreciate it. Thank you to everyone who made such a fantastic effort. Stephanie was overwhelmed and very touched by all her lovely cards and gifts. Stephanie enjoyed her 18th birthday very much. We had a huge party with a children’s entertainer and ‘retro’ party food and she had a fab time! She had her hair and nails done at the local salon and looked a picture! Thanks to everyone who sent cards and gifts – there were a lot and we have been very busy as you can imagine, so please forgive us if we haven’t written personally to say thanks, but we DO thank you very, very much. We are now gearing up for Christmas with the family and Stephanie is busy making cards for her nephews and niece! Stephanie has had a very sad month as her beloved Nannie died and we had the funeral on 17th October. Stephanie passed TWO GCSE’s in science and food technology – what a clever, clever girl to have an ‘Ology! We have been busy this month as Stephanie’s Nannie is in hospital and very poorly indeed, so hasn’t been much time for anything else. Stephanie has been very good and deserves a large treat once mum isn’t so busy! Stephanie had a fabulous holiday in Dorset with OTW – thanks to Post Pals! We spent the last week in August in Norfolk at a lovely disabled friendly cottage – lots of lunches out and smashing shopping. Stephanie is gearing up for going back to school now but will be camping in Exmoor on her second week – its holiday, holiday, holiday! We went to see Kylie at the 02 arena this month which was a highlight. Stephanie was very happy and sang along to all her favourites. We also bought a Kylie T-shirt which she is proud to wear. Stephanie has lots going on in the holidays and she has two camping trips planned! Stephanie is well at the moment and she’s looking forward to being a bridesmaid for her sister Emma on 2nd August. Her dress is yellow and white with daisies on the top – her grandma made it for her. We are also going to see Kylie at the end of July at 02 and she can’t wait for that! Thanks for all your lovely letters, presents and emails. We try to reply to some but can’t manage all. Steph has had a bad month with several infections, but she’s picked up a lot and we had a nice holiday in Pagham for four nights in the Children with Special Needs caravan at Church Farm. We had a smashing time, despite the weather! Stephanie had a lovely visit to Douglas House hospice in Oxford this month and enjoyed herself very much. She can’t wait to go again! Thanks for all the lovely presents, cards and letters. We do try to reply to as many as possible, but please don’t be offended if we can’t get to yours. Stephanie is a bit wobbly at the moment – we’ve increased her meds again and are hoping for the best. She now sleeps downstairs in her purpose made bedroom with princess bed covers and a super en suite shower room which makes life much easier. She’s still smiling through it all. Despite all her own problems, Stephanie, with her colleagues from school, will be running (or in Stephanie’s case being pushed around) the Race For Life course at Battersea on May 7th. We didn’t have a good start to the year as Stephanie had a seizure last Saturday and we had to call the emergency services. She recovered quite well but we have had to increase her medication and she’s still a bit wobbly. Nothing gets her down for long and she didn’t actually register she’d had the fit at all anyway – just demanded a huge breakfast afterwards because she was so hungry! Keep your fingers crossed that the medication keeps any further fits at bay! Thanks again to our friend in Israel for a beautiful necklace, much admired by Stephanie’s friends. We had a great Christmas and we spent New Year in Cornwall, but Steph has been ill with a urine infection and is on antibiotics again. Thanks to everyone who sent cards and letters. We can’t possibly reply to everyone, but thank you all and we really do appreciate them. Stephanie has had a fabulous half term. We went to Alton Towers with Berkshire Blind Society and had a wonderful time. We loved the rides and the scary characters for Halloween and Stephanie had a smashing break. She’s had a bad cold and is on antibiotics but is getting better quickly. The new medication continues to help her mobility and awareness and she is in really good form at the moment. Stephanie has had a lovely summer holiday; we took a lovely break to Norfolk last weekend and went to the end of Pier show at Cromer which was fantastic – highly recommended! We also went on a steam train and had lovely meals out but Steph’s favourite time was a trip to a jewellery shop as she loves her jewels nearly as much as her family! All is good on the medication front; the changes seem to be helping mobility slightly. Stephanie’s now looking forward to returning to school as she loves her pals there and all the exciting events that take place – you would think it was Hogwarts! Stephanie also has a new nephew Charlie, born on 27th August – a week late. Stephanie made him the biggest card in the world with all her love inside! Thank you to Helen, she’s lovely! Also to our anonymous friend in Israel, who never fails to send exciting packages! 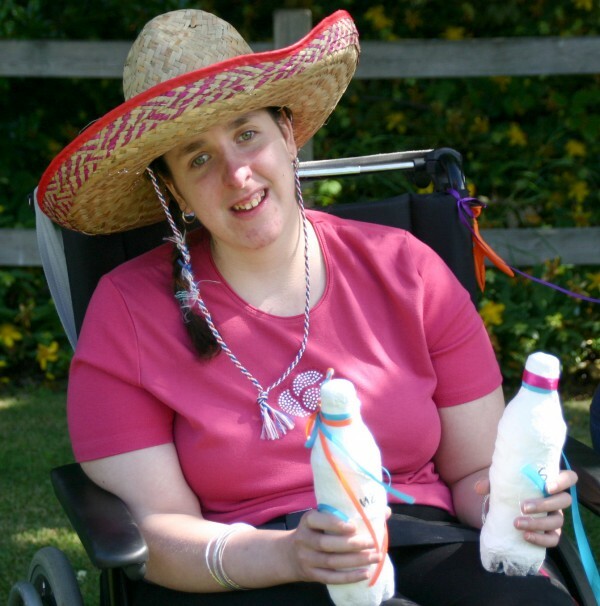 Summer holidays are here and Stephanie is busy with her Disability Challengers group – she was bowling today and has plans for fruit picking, BBQs (weather permitting) and days out at several nice parks. She’s happy and upbeat and we are still waiting for updated medication – its taking a long time to sort out. We’ve just got back from Disneyland Paris which was wet but wild! All had a good time. We have new research suggesting Stephanie needs a change of medication which may help her mobility and hopefully her speech. Please keep your fingers crossed for us. Stephanie has had a lovely half term. We went to see the new Pirates movie and it had audio-description which was marvelous! Most cinemas offer this facility at selected viewings now and it makes such a difference. We also went to the Thriller spectacular at Hammersmith (a celebration of Michael Jackson and the Jackson 5’s music). Stephanie wasn’t really that bothered about going but at the interval said she loved it and did we have the music at home. Unfortunately it’s all on vinyl as we are so old, so we’ll have to buy all the CDs to put on her MP3 player now! Then we went with Berkshire Blind Society to London Zoo for the day. It’s nice that Stephanie is now back at school, so mum can have a rest! Stephanie raised £468 plus tax credits for cancer research during May. She did the race for life and was pushed by her PE teacher in Battersea… but walked over the finish line… amazing! Stephanie received some lovely story tapes received this month. Thanks to everyone. Stephanie had a wonderful day out courtesy of the Willow Foundation last Saturday. We went to London, on the Duck tour, to Hamleys shopping, went to the most wonderful production of the Sound of Music at the Paladium and finally had dinner at the Wolseley. It was amazing! We have increased Steph’s tablets to take effect so she can avoid another fit. Stephanie’s speech is very hard to understand and her mobility is getting very bad. Sorry, think we may be on the ‘home run’ with the disease – life is going to be quite difficult I think from now on! Our friend in Israel is very good and sends something every month – Stephanie likes it very much and is very grateful. She loved her CD of love songs! Thank you – her friends at school are very jealous! Stephanie has had a good January, apart from a cough, cold and earache, par for the course in the weather really! We’ve had a musical month, seeing Kylie and the Pussycat Dolls at Wembley which was fab. She enjoyed both concerts and Wembley Arena is really geared up for wheelchair access. We had amazing seats, if a bit noisy! We’ve had lots of family get togethers this month because Stephanie’s new nephew arrived on Christmas morning, so we’ve been showing him off and he’s been meeting all the family members. Thanks for all your cards and wishes. We went on holiday to Lanzarote on 28th December for a week and Stephanie had a lovely time splashing in the pool and eating out at some local restaurants. We also had a BBQ on New Year’s Eve – not often you can do that! Stephanie had an absolutely lovely Christmas with the best present ever – a new nephew arrived Christmas morning and she was able to go to hospital and have a cuddle after lunch. We all had a fine time and all your lovely presents and cards made it extra special. She was very excited and thanks so much to everyone for all their thoughts and kind gifts. Stephanie is doing quite well at the moment, her walking is ok and she is stable. Stephanie loved her birthday party and looked fantastic in all her new party gear. She was unfortunately very poorly the week after with a bad cold, earache and sore throat but is better now and had a good time at school last week with another birthday cake and party with her friends there. Thanks to everyone for Stephanie’s lovely cards and gifts for her birthday. She really enjoyed them all. Stephanie is back at school after an interesting half term. She has bought a lovely dress and jacket for her birthday party on 18th November. We had a lovely day out at Cadbury World with our local blind society too. She’s on good form and very stable at the moment. Stephanie will be 16 in November and we are holding a big party for her at a local hotel. She’s really looking forward to half term as we will be shopping for a special outfit to wear (and new shoes, all girls love new shoes). She has saved up to have her hair done for the special day also. Stephanie’s granddad has been very, very poorly so we have been very busy visiting him in hospital but he’s back at home now and much better. Stephanie had a lovely holiday in Florida and is missing all her lovely new friends from all over England. Half term is boring as she has post-holiday blues! Stephanie is going to Florida from 29th April on a charity holiday with 11 other youngsters! I’m sure she’ll have a great time as she is very well at the moment. She was so excited this morning driving to the airport hotel where they are staying tonight. Special thank yous to Julie and Elizabeth for all their lovely gifts and to Becky for the story tape. The new drug we are trying for Parkinson type symptoms is helping Stephanie to walk a little better and makes her more flexible. Thank God! We had a lovely holiday in Tenerife this month, following an awful flu bug which left Stephanie very weak. She still has a bad cough but is getting better each day, but she unfortunately missed two weeks at school and missed out on all the activities they organize, including a theatre trip. We are now on Easter holidays, so post would be most welcome as I know she will become just a bit bored! Thanks for all your good wishes and please keep writing, it makes Stephanie’s world that much brighter! We’d like to thank all our friends in Myrtle Beach, America for their kind words and cards. We think it’s amazing that people in that lovely place are praying for us! Also thanks to the anonymous person in Israel who sends lovely hand made cards. Many thanks to everyone for all the very thoughtful presents. Stephanie’s received lots of lovely things and many, many cards, letters and postcards. We reply to some, but can’t possibly reply to all, so thank you and everything received is much appreciated. She is very excited when she comes home from boarding school on a Friday to open all her special things. We are trying a drug used for Parkinson’s disease at the moment which may help Stephanie’s mobility. We should know in a couple of weeks.